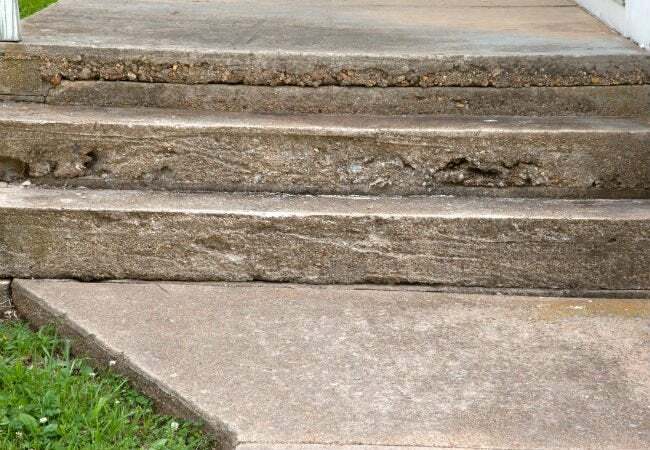 Do you have an unsightly fissure on your concrete driveway, stairs, or foundation? Get cracking on these simple but vital repair solutions! Despite its reputation as one of the most rugged building materials ever conceived, even concrete has a sensitive side. Drying shrinkage, chemical or environmental corrosion, or even just regular wear and tear can create cracks that grow in size and severity if left untreated. Fortunately, small cracks in driveways, stairs, or the foundation can be repaired without too much muss or fuss. So, put on your gloves and safety glasses, and add these solid concrete repair solutions to your masonry skill set! Small, surface-level fissures can form on driveways new and old, but they don’t represent an earth-shattering problem if caught early. These hairline cracks, often created when concrete weathers and separates, can be easily and economically filled. First, remove any loose particles of concrete with a screwdriver or chisel, and then use a wire brush followed by a broom to get rid of any remaining debris. 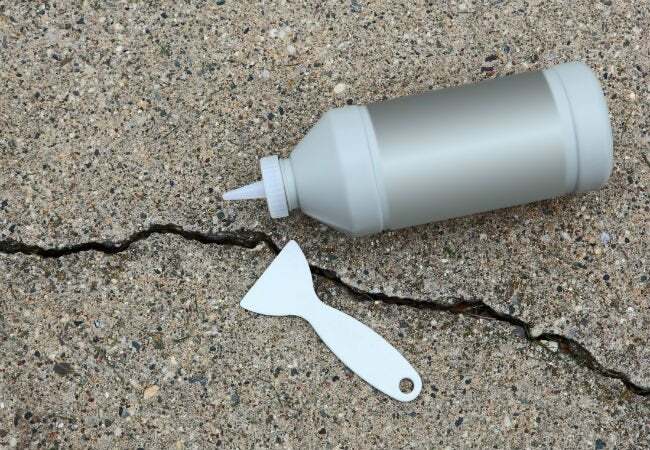 Pick up a small supply of concrete patching compound or masonry crack filler (you’ll find them at the hardware store packaged as either squeeze bottles or tubes to insert into a caulking gun), and apply the compound into the crack, using a putty knife to smooth out any excess. After the compound cures, spread a sealer to prevent the crack from growing larger and to protect it from the damaging elements. Cracked concrete on stair edges or corners can rob a walkway of style while also posing a safety hazard to passersby. Fortunately, you can transform these crumbling contours into a stunning staircase using simple materials and tools. After removing any damaged concrete with a small sledgehammer, sweep the area clean with a brush and broom, and then hose it down with water to provide optimal adhesion for the patching compound. You’ll want to use a wood form to ensure that your concrete takes the proper shape, so place one or two planks against the edge you’re trying to fill, and set a brick against the outside of the wood to hold it steady. Make sure the height of the planks exactly matches the height of the stair. Following the manufacturer’s instructions, trowel premixed vinyl compound into the space created by the form. Once the patch has set, remove the form, and let the compound cure into a flawless flight of steps. 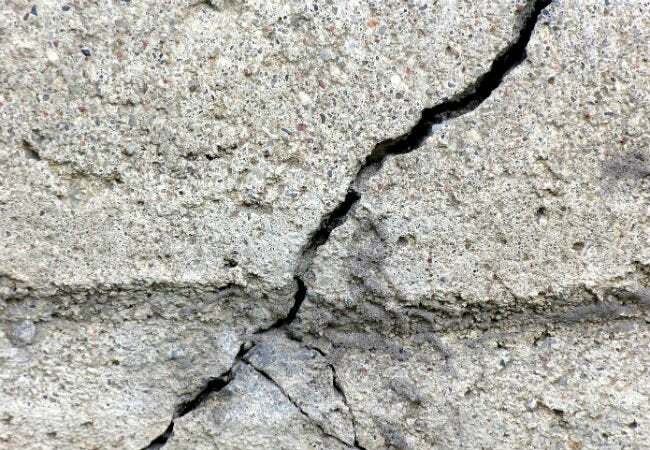 Forgotten cracks in your concrete foundation today can present serious structural issues that may require a professional tomorrow. 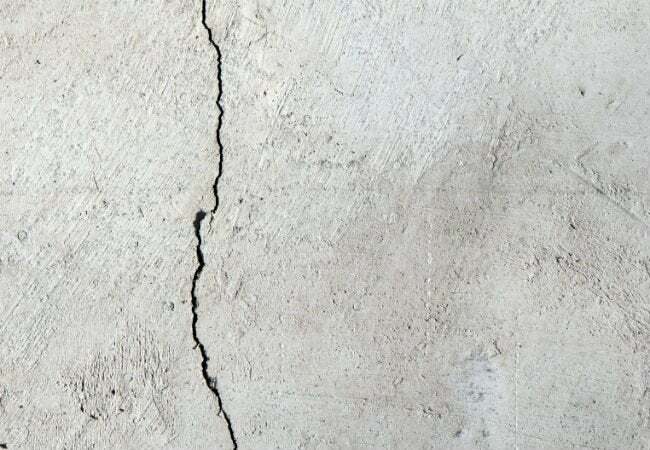 To rein in smaller cracks (between one-eighth and one-quarter of an inch), start by cutting away crumbling concrete with a chisel or sledgehammer, undercutting the edges so the adhesive doesn’t slip out of the cracks. Then, brush the area clean, and mist it generously with water to help your compound stick. Apply a mixture of dry vinyl concrete patch powder and latex to the crack, and smooth it with a trowel. If the surrounding concrete isn’t smooth, sweep over the area with a broom until the patch blends in seamlessly.